Hunting / Recreation: Located north of Waterloo, AL and just off of CR 14, this property boasts an abundance of large deer and wild turkey – last year the landowner saw 42 turkeys on opening day of season. There are several established green fields in the valley and on top of the hill. The landowner will be leaving approximately 30 hunting stands, some brand new, and several large two-man elevated shooting houses. If you enjoy bird watching, Waterloo is known for its numerous wild birds including the bald eagle. Enjoy your walk among the many acres of large trees, including a walnut grove, and the many wild azaleas over 15ft tall. For the fisherman, you are only 5 minutes from the nearest public boat ramp on Pickwick Lake. Home / Barn / Creek: 24′ x 52′ manufactured home recently re-leveled, new skirting all around, and new front door, located next to a beautiful creek. This creek runs through the property for over 1/2 mile long, and never dried out even during the 2016 drought. Also included is a 24′ x 52′ newly constructed tractor shed on a concrete slab with 2 sets of drive-thru doors and a wood heater not yet installed. This property has a rustic, usable barn excellent for storing items out of the weather. 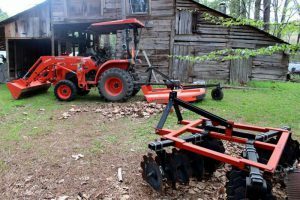 Tractor / Implements: Almost new with low hours 40 horsepower Kabota tractor with front-end loader, trailer for pulling the tractor, large disk (apx. 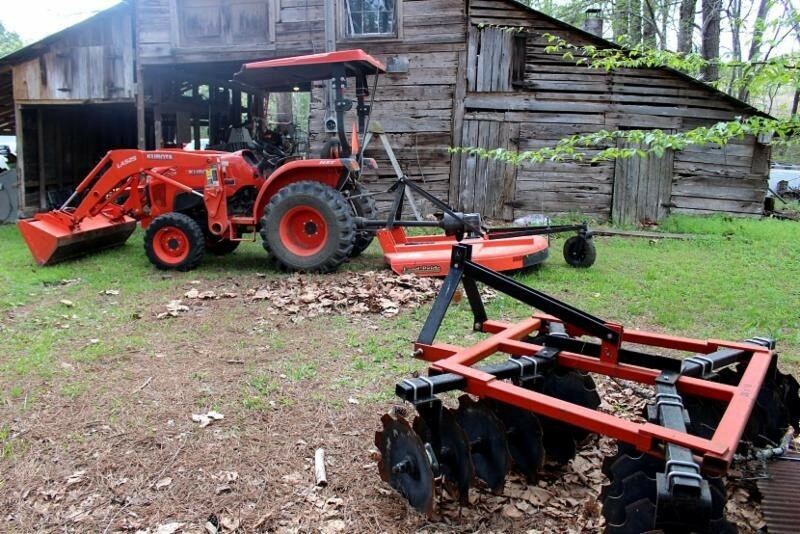 6 ft), 2 drag harrows for leveling and feeding, 3 point hitch lift and plow, bushhog, landscaping box blade, seeder/fertilizer for a tractor, and seeder/fertilizer for a 4-wheeler.